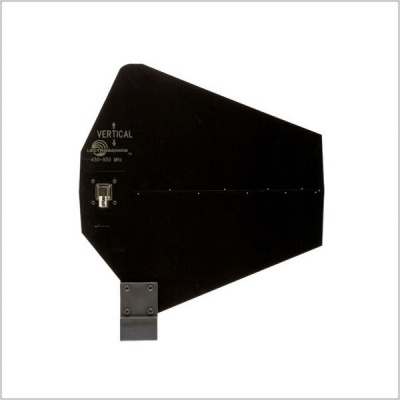 The ALP Series antennas are a Log Periodic Dipole Array (LPDA) design that provides a useful directional pattern over a broad frequency bandwidth. Many “gain antennas” (those designs with a directional pattern) are limited in bandwidth, making them awkward for use in multi-channel wireless systems and with frequency agile wireless systems. With VSWR below 2:1 from 450 to 862 MHz, the broad bandwidth of the ALP Series covers a broad section of the band used for Lectrosonics wireless microphone and IFB systems, yet still provides the directional pattern needed to cover long distances. All ALP Series antennas are constructed of 1/8” FR4 fibreglass circuit board material and are extremely rugged. The ALP620 and ALP650 Series antennas include a protective cover over the BNC connector, making them suited for field production, while the more economical ALP500 is better suited for indoor installation. The perforated body of the ALP620 makes it resistant to wind loading outdoors. The ALP650 models are “receive only” models, featuring a built-in amplifier with adjustable gain for use with long coaxial cable runs and/or RF splitters. 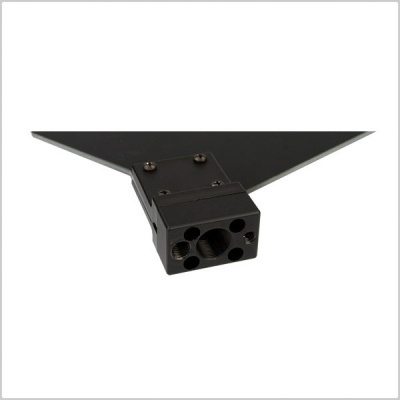 The antennas can be mounted horizontally or vertically by removing four screws and repositioning the mounting block. This helps to position the antenna away from nearby reflective surfaces to preserve more of the natural pattern of the LPDA design. A 3/8”-16 stud is included with all ALP Series antennas and there is the option to purchase a zipped Cordura pouch for ALP antennas.